Janice H2O Color: Plenty of Plein Air at Asilomar! I attended the annual Santa Clara Valley Watercolor Society Paint Out at Asilomar this past weekend. Three days devoted to plein air painting with no other distractions or responsibilities was such a treat! For those of you who are unfamiliar with it, Asilomar began in the early 1900s as an oceanside retreat on the beautiful Monterey Peninsula, and was owned by the YWCA. It's currently part of the California state park system. The old wood and stone main lodge, dining hall, and several other buildings were designed by noted architect, Julia Morgan. She designed Hearst Castle, Wyntoon, and scores of other houses, schools, and public buildings. All meals are included, making it a carefree weekend. I shared a room (very simple with no tv, radio or phones)with Kaaren-an ideal roommate! We had early nights, as we were warned not to leave our rooms after dark due to the mountain lion that is currently making the area his home. It would have been nice to take a walk on the boardwalk across the dunes over to the beach, as the moon was full, but we didn't want to take a chance on ending up as cat food. Friday was a beautiful day. 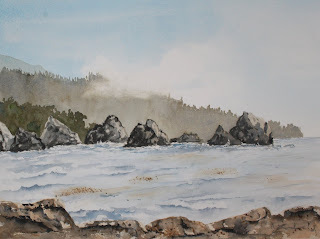 We drove directly to Point Lobos and set up by the ocean, where I did my first painting to the sound of sea birds and barking sea lions-rocks and a pine-covered promontory surrounding a little inlet. The brownish spots in the water are kelp. I worked on blocks the entire time-easier than carrying stretched paper around. 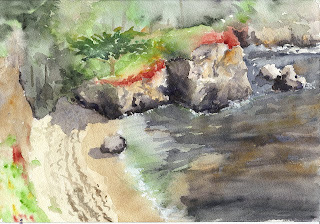 After about 2 1/2 hours, we walked up to an overlook whose name I can't recall and I did a quick little painting, looking down and across a small beach area. The ice plant, a succulent that is prevalent in the area, on top of the cliffs begins turning red in cooler weather. I was trying to be a little looser than normal...really did not succeed with the dense green black cypress on the opposite cliff. After 3 days, I have a much better idea of how to approach them. While at this site, we met several people-a nursing mother who was famished and asked if we had any trail mix or something she could have, as she was feeling faint, (I had some crackers), and an older Russian man, Igor, who told us in halting English that he's the head of the Russian "Aquarell Federation!" He was very interested in our materials, and was familiar with Winsor & Newton. It was a great start to the Paint Out! We joined our fellow painters for dinner and a casual critique afterward.